Puglia is a beautiful region, a bridge between East and West, a land of amazingly diverse landscapes, rich flavours and unique colours. 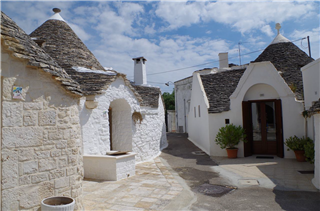 Our Italian language course will take place in Salento, one of the most popular locations in the Puglia region, an area that extends from Lecc e to the heel of Italy and the Itria Valley – characterised by white towns and the traditional “trulli” – old buildings listed among UNESCO World Heritage treasures. We will journey through landscapes bathed in white, immerse ourselves in a mixture of different cultures and sample delicious traditional local food. Learning won’t stop when classes end but you will be too busy enjoying yourself to notice! Groups will be formed according to language proficiency levels so that each language course offered in these packets will be tailored to specific language targets.